Home / German Nationals in Schwerin. The club has organized a training, executed by Mischa Heemskerk ahead of the event. Forecast looked rather promising for first race day, so the race comittee sent the send the 33 boat fleet in five races, making the most out of available wind. Conditions have been tricky for participants with very patchy, narrow lanes of wind, allowing for gains when getting quickly enough on the foils before wind was over. 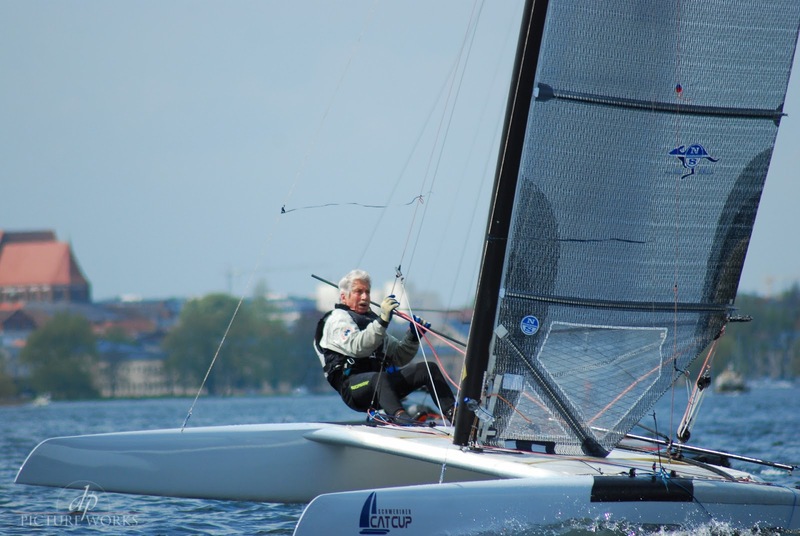 Thomas Paasch showed the most consistent results with a first place on leaderboard after first day on water followed by Roeland Wentholt and Matthias Dietz. Mischa got his grip on conditions in third race, which had the best wind conditions on that day. In last race he had been forced out by mechanical issues. The last two races have seen Martin Bach in the lead on its classic DNA, a move up that wasn‘t achieved by other classic boats in the fleet. On Sunday forecasts materialized in some long waiting for the breeze, which eventually allowed for one race in shifty/patchy conditions. Leading for a win of Helmut Sturmhofer, who moved up to fourth overall, followed by Kathrin Brunner and Niklas Lange. 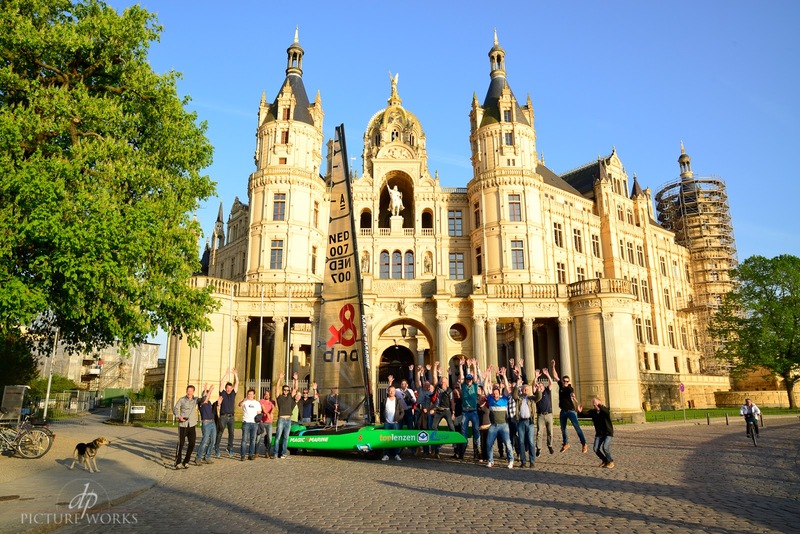 The sunny day on the water concluded with a dinner in the picturesque Schwerin castle, which acted as a perfect backdrop of a participants portrait together with Mischas green F1x. On the final race day conditions have been unstable with forcecasted wind increase. Race seven started in lighter conditions. 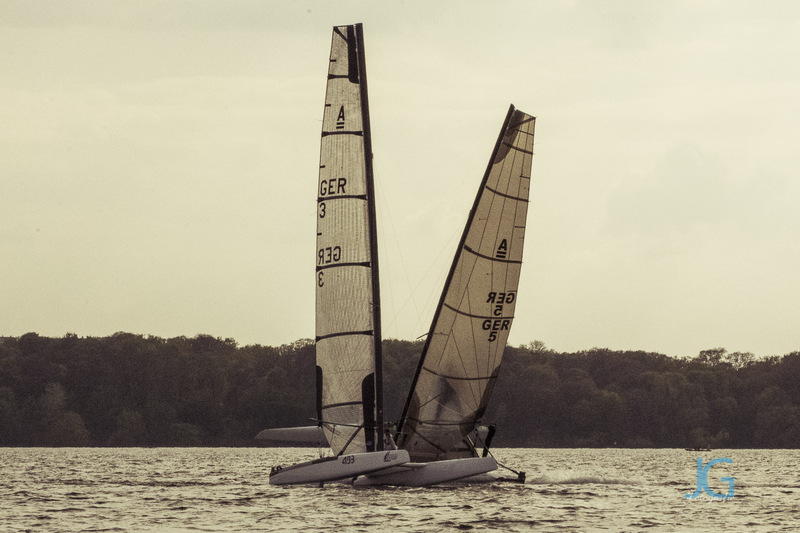 After an awaited windshift materialized, races eight and nine have seen rather windy conditions with gusts up to 20 kts, leading to multiple capsizes. No changes at the top of the leaderboard on the last three races, with Thomas Paasch crowning the International and overall winner of the Regatta. Participants loved the event atmosphere at hosting club and its location, which made an effort to accommodate some 50+ catamaran crews of multiple including establishment of temporary slip ramps. 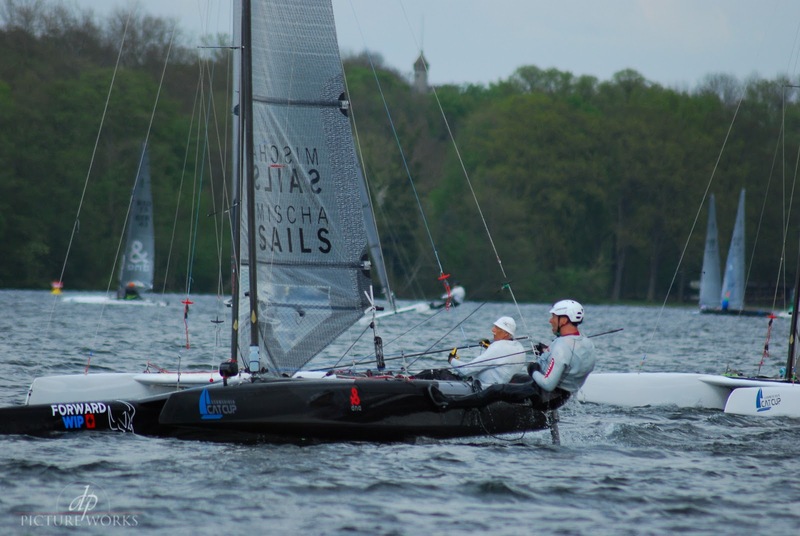 Besides the race committee made the best out of conditions, all in all being reason enough to visit the annual Schwerin Cat Cup next year again, even without the Nationals. Saturday and Sunday the course was shared with Hobies and Top Cats. The course was a “Trapezoid course”, sending the A-Class to the outer loop, which effectively ensured there was minimal interference with the other classes who stayed on the inner loop. But it did add some hairy moments on the reach between the top-marks. On the first day of racing 5 races where completed. Weather forecast for Sunday was very light and for Monday the forecast was over the limit, so they wanted to make sure we got some races in. The wind was patchy, shifty and gusty, and it was all about being in the right spot at the right time and connect the pressure areas. If in the right spot, downwind foiling was possible for the first 3 races, while the breeze was dying in the last 2 races, paving the way for Martin Bach to win the last 2 races in his classic DNA. The battle for first place was intense. The lead shifted back and forth with almost every race between Roeland Wentholt and Thomas Paasch. After 5 races and 1 discard Saturday ended with Thomas leading by 4 points. Sunday was a day of waiting. The water was flat as a mirror with absolutely no wind. The AGM of the German Association was moved forward, to open for the option of a late afternoon race. At around 16:00 hours, boats where send to the lake to complete a single race in very light and fluky conditions. The top of the leader board was unchanged, but the lead had shrunk to 3 points. In the evening the regatta dinner was at the Castel in what appeared to be an orangery or something like that. For Monday the forecast was for a front to pass, change in wind direction of about 100 degrees, showers, strong gusts in the high twenties and even a risk for thunderstorms. But things turned out a lot better. A strong onshore breeze made it difficult to dock out, but once we were on the race course, the wind had dropped to a well-known fluky breeze with lots of holes and mainly not even trapezing upwind, except for the very light guys. The lead had shifted back to Roeland with a 1 point lead after the first race of the day. Then started a long period with turning winds where only one start was attempted but it was aborted before the gun as the wind kept turning. 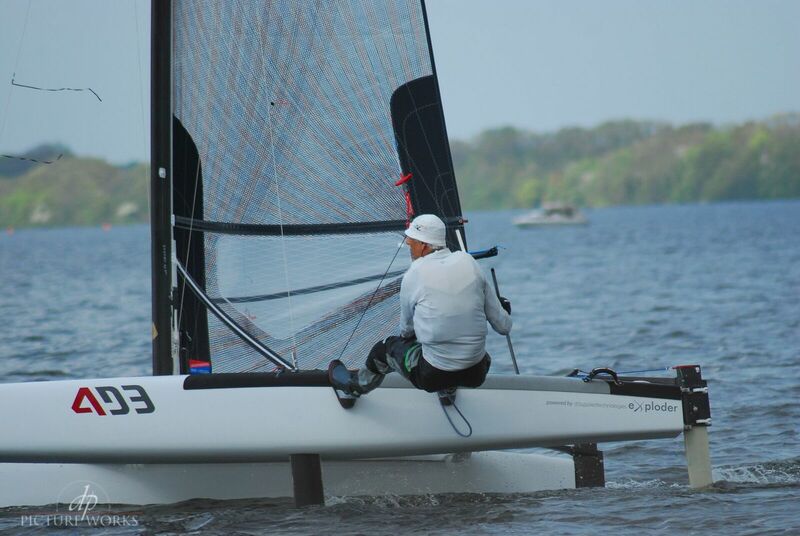 Once finally stabilized, the wind kicked in and downwind foiling was once again the deciding feature. Roeland misjudged the layline on the final downwind, and the lead once again shifted into the hands of Thomas with a 1 point lead. In the final race the wind was getting strong and the committee boat measured gusts exceeding 24 knots, so things got hairy if you were in the wrong place at the wrong time. A big gust ran down the left side of the course on one downwind leg and wiped out those who were foiling down that side. Roeland was amongst those, which handed the advantage to Thomas to seal the deal if he could play it safe and keep the pointy end up. Michal Korneszczuk claimed the final win just in front of Thomas, while Roeland had to settle for a mid-fleet finish. Aged 68, Mathias Diets took the German title. Helmut Stumhofer was hot on his heels, but a broken trapeze bungy kept him out of the 8th race, else it could have been a very close fight for the German title as well. Best classic was Martin Bach in 6th place and best female was Katrin Brunner in 12th place.